Ongoing back pain disrupts daily life and makes even the simplest of pleasures — taking a walk, shopping, gardening, playing with your kids or grandkids, watching a movie, or even napping on the couch — difficult to enjoy. Luckily, many back pain sufferers in Fort Wayne have found that the DRS Protocol offered at Busch is a lifesaver that allows them to quickly return to enjoying normal activities and daily life. 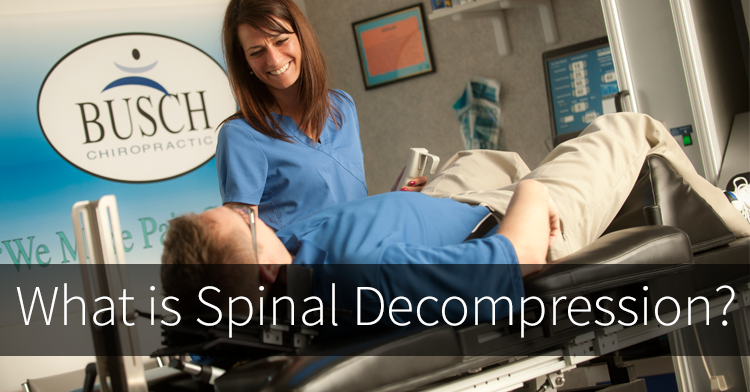 The DRS Protocol™ treatment, developed by Fort Wayne Chiropractor, Dr. Busch, utilizes spinal decompression to provide pain relief for a range of back and neck pain conditions, but what is spinal decompression? Spinal decompression is a nonsurgical treatment frequently used to treat low back pain and neck pain conditions such as herniated or bulging discs, degenerative disc disease, and back injury or trauma. Spinal decompression therapy gently stretches the spine to take pressure off of the spinal discs (the “cushions” between the bone segments of the spine). The release of pressure on the discs promotes the flow of nutrients, oxygen, and fluids into the discs to allow for healing, improved flexibility, and decreased pain. This highly successful treatment is a favorite of doctors wanting to give their patients an effective alternative to harmful pain medications and invasive procedures such as steroid injections or back surgery. It allows back pain sufferers to recover without the many risks of back pain surgery including infection, blood clots, and nerve damage. Many patients found that back surgery did not improve their pain significantly, and in some cases made the pain worse. At Busch Chiropractic, we take spinal decompression further. Because each patient's condition is unique, spinal decompression is only one part of our highly successful DRS Protocol™ treatment which includes multiple therapies proven to help relieve chronic pain conditions and is only found in Fort Wayne at the Busch Chiropractic Pain Center. We customize treatment for each patient making it even more effective. The DRS Protocol™ is a safe, non-surgical, and drug-free solution that Busch Chiropractic has successfully used to treat thousands of chronic pain sufferers. Patient reviews show that spinal decompression, as part of Dr. Busch’s DRS Protocol™, allows them to live pain-free and return to an active lifestyle. We believe nobody should have to live in pain! If you or a loved one is suffering from chronic neck pain or back pain, contact Busch Chiropractic today at (260) 471-4090 to schedule an appointment.